I've never read a novel on knitting, so when this was brought to my attention by Sarah of Crafts from the Cwtch I thought I'd give it a try. 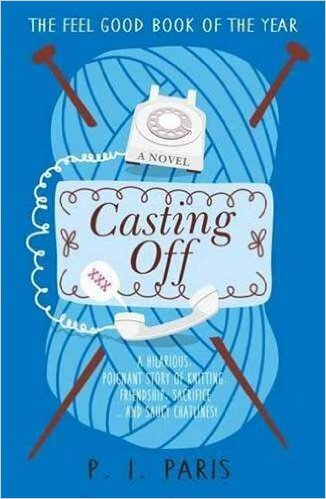 As I read this on my e-reader I hadn't read the blurb, but I had preconceptions this book would be about a 'knit and natter' group using knitting to escape the day to day realities of life. However, this book was nothing like this at all and as I read on I was surprised over and over again. One of the first surprises for me was that it was set in a care home in the Scottish Highlands. My experience of care homes is very limited so I did initially feel that I would find it difficult to relate to this book, but the huge variety of topics covered in this book are very applicable to modern society, and would strike a chord with anyone. The crux of the story is a private company taking over of the care home, resulting in a rise in fees that the residents would not be able to meet. As the key characters in the book were perpetual knitters initial indications suggested that they would try to make up their fee shortfall through their knitting (there was a great reference to knitted egg cosies here......). What actually happens couldn't be more different and I'm not going to spoil anything, but what I will say is that it was at times heartwarming, hilarious, and seriously dark in parts. P.I Paris has done a great job of developing the personalities of many of the residents of the care home and has cleverly used the huge wealth of life experiences of the elderly characters in this book to bring to light very serious issues present within current society. In parts this novel is very poignant and thought provoking, especially where themes of the bonds that form between residents are explored. If you are looking for a novel focused solely on knitting then you may be disappointed, as knitting does not end up being the main focus of the book, though it makes an appearance in ever chapter, and is at one point used as a clever cover-up for a covert operation! However it is a really good read and I'd highly recommend it. This book will shock, make you laugh and make you cry. If you read it I would love to hear your thoughts. The cover of the book attracted me right away. Sounds interesting too.